Ted Larson introduced me to Chris Jacobs one evening at Weld Hall in the late 1980s. I was in high school then, but Chris recognized fellow film fanatics, and we would chat a little bit each week. I learned quickly that he loved movies as much as anybody, and had a special fondness for the obscure and little-seen “gems” from the silent and early sound eras. Over the next decade, I came to respect Chris’s dedication and devotion; he lived in Grand Forks and yet, every Monday during the Summer Cinema series he made the drive to the campus of Moorhead State University (now MSUM) to see whatever Ted had programmed. I soon began attending the two annual film festivals recognized by Ted Larson as the Mount Everest and K2 of rare movie thrill-seeking: Cinefest in Syracuse, New York and Cinecon in Los Angeles, California. Upon arrival, I would collect my program, look over the list of films so uncommon that many had not been publicly screened since their original release dates, and head for the auditorium. No matter how early I arrived, Chris was already in his usual spot. After watching features back-to-back-to-back for hours, when my brain pounded against the inside of my skull and my bloodshot eyeballs begged for mercy, I would scan the room on my way out. Sure enough, Chris was still there, drinking in the images on the silver screen. In 1997, I wrote my first article for the High Plains Reader, and not long after that, editor John Lamb invited me to join Chris as HPR’s other regular contributor on the topic of movies. Chris and I coexisted peacefully in print for -- can it be? -- the next twenty years. Initially, I somewhat reluctantly deferred to his senior status, coordinating reviews so we could avoid doubling-up. Once in awhile, we did end up covering the same title, but it never bothered us. Eventually, Chris turned his attention to an ongoing series of diary-like chapters on do-it-yourself moviemaking, offering practical advice to aspiring directors. At the time, I was just happy to have the pick of new releases all to myself, but in hindsight, I gained a new level of respect for Chris. His digital moviemaking columns paralleled the ambitious run of micro-budget features that he wrote, produced, and directed. 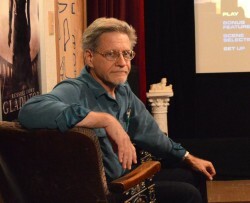 From noir crime thriller to backstage musical to body-switch comedy to supernatural horror (that allowed him to indulge his longtime affinity for ancient Egypt), Chris satisfied another facet of his all-encompassing passion: learning by doing and gaining a deeper understanding of all things film in the process. Chris got things done, and the list of his accomplishments has been documented in several other recent tributes. When it came to the content Chris made, you had to expect the unexpected. A music video for local heavy metal heroes Sons of Poseidon? Check. A contemplative, meditative visual essay on loneliness and loss -- starring his father -- submitted as an entry for the Fargo Film Festival’s 2-Minute Movie Contest? Check.